In XenoShyft Onslaught players take on the role of a commander in the NorTec Corporation. You're tasked with defending your division of the NorTec base as wave after wave of horrific aliens attempt to destroy the base and end NorTec's strip mining operation. 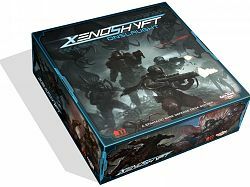 XenoShyft Onslaugt is a base defense deck-building game for 1 to 4 players. Using a wide array of troops, weapons, armors, and technology cards, players must last 9 rounds as the alien hordes bombard the NorTec base in increasingly difficult waves. XenoShyft Onsluaght has many deck-building elements, but plays more like a table top version of the base-defense game genre made popular on mobile devices.